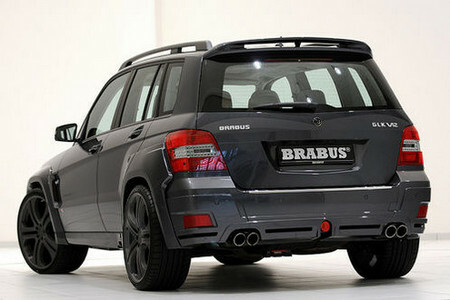 German tuner Brabus has released details of their latest product which is a ridiculously powerful Mercedes Benz GLK! At the previous Geneva Motor Show, Brabus had revealed a V8 version of this car, but now they are introducing a monstrous V12-powered model. The car will debut at this year’s Dubai Motorshow. The Brabus GLK V12 gets the firm’s famous twelve-cylinder twin turbo engine with 750 hp which turns this otherwise efficient crossover into the fastest SUV in the world with 322 km/h top speed! To meet this goal the engineers installed a number of new parts including a special twin turbo system with two larger turbochargers and more efficient intercoolers, free-flow metal catalysts and a fully stainless-steel high-performance exhaust system custom-tailored to the GLK. And they achieved great results! as the engine returned 750 hp (740 bhp) / 552 kW at 5,500 rpm and a peak torque of 1,350 Nm (995 lb-ft) at 2,100 rpm, limited in the car electronically to 1,100 Nm (811 lb-ft). The enormous power is transferred to the rear wheels via a reinforced five-speed automatic transmission and a Brabus limited-slip differential with a locking rate of 40 percent.The performance of this amazing car in simply staggering: it has a 0-100 km/h (62 mph) sprint time of just 4.2 seconds and 12.8 seconds to 200 km/h (124 mph), with a top speed of 322 km/h (211 mph). 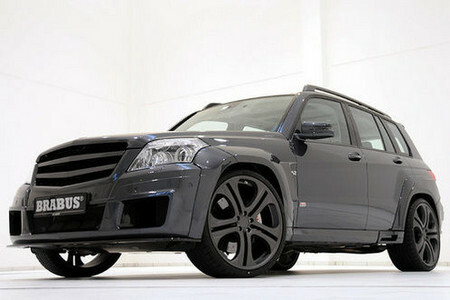 The GLK V12 also sports Brabus Widestar body kit which not only give it a mean face, it also improves the aerodynamics. ts large air dams provide radiators and front brakes with ample cooling air. In combination with a carbon-fiber spoiler lip the front apron also minimizes aerodynamic lift on the front axle – a prerequisite for directional stability beyond 300 km/h. At the back you get a modified rear apron with a centrally located reflector, and custom-tailored cutouts on the right and left side to provide the perfect backdrop for the four characteristically shaped tailpipes of the Brabus stainless-steel sport exhaust system.The car is also 5cm wider and 30mm lower than the standard. Brabus has also refined the ride and handling by installing a sport suspension system and 22-inch lightweight wheels from its Monoblock family which can be had with Pirelli and Yokohama can be mounted up to size 285/25 ZR 22. Inside the cabin, the GLK V12 comes with a Brabus fully leather interior that can be further refined with Alcantara elements if desired. The interior appointments are rounded out with an ergonomically shaped sport steering wheel, a speedometer with 330-km/h (205-mph) scale and stainless-steel scuff plates with illuminated Brabus WideStar logo. You also have the choice of wood or carbon fiber trimming for dashboard, doors and center console.